Twitter is a most powerful tool for making your business reach out the world in more number. All it takes is one thing that you have to be careful at. Tweet as like it is the only thing you are best at. Your Twitter account is made easy for tweeting with just 140 long characters. All it takes is cunning headline content with the link to your blog. Tweeting is made even easy with number of Apps that help you manage your Tweeting even more exploring and interesting. Here, are some of the tools which I prefer as the best for me to manage my Twitter tweetings more interesting. I was thinking of starting with something that I really think its useful for me in all the ways. Buffer is an exemplary tool to manage your Twitter tweets. Buffer started with some users and it has now been emerged to a level with 400,000 users world-wide. For those who don't know about Buffer, it is an extra-ordinary tool to manage your Social networking accounts. It manages your Tweets along with its own URL Shorteners. It is an awesome tool to manage your account. You can use it as a plugin to your Blog, or you can use its Chrome Plugin which is useful for tweeting even if there is no buffer plugin installed in a website. Once you signup to Buffer, you will be provided with 10 slots and whenever someone uses your referral you will be rewarded with a free slot to buffer your tweets. It provides you the information of how many have clicked your tweets, how many have actually viewed it etc. Another feature is that, you will be able to schedule your Tweets when you have to tweet. It helps you to tweet even when your are not online and it saves your time. I prefer Buffer and I have been consuming my time a bit lately. You may think a while seeing the title above as why he is referring a URL shortener in the second place. Even I was wondering about this to put it in second place. And then I figured its worth it anyway. Yes, Bitly is a URL Shortner but its been of great use to me in tweeting my posts along with my URL shortened. It is also integrated with Twitter and its basically provides you analytic information of your tweets and how much clicks it has got. I reckon this is a great feature to maintain a watch over your tweeting. It is the top most used URL shortener with analytics dashboard. The customers can set up a domain inside their account to group all the links they have shortened in order. So, I guess it solves the question for me to put it in second place. It is an awesome tool that manages your Twitter account as the way you instructs. Once you signup for Hootsuite, you can synchronize all your social networking accounts with it. It is a social media management tool and I mainly use it with my Twitter and my Facebook personal account. It allows you to share your posts in all the social networks you've clicked on the menu. It displays your Twitter stream in one column and your other social media profiles in other columns etc., so that you get the feel of multitasking. Tweetdeck is also a Twitter Management Tool which is specially designed by Twitter guys. It also manages your other social networks like the same way as Hootsuite performs. The one awesome feature of this tools other than Hootsuite is that it is available both on web and as a Desktop Application too. Hootsuite is not available as a desktop app. You can tweet your posts right from in your desktop so that its no need to login to the browser. You can even schedule the tweets by setting the time you want to share on your stream as like buffer. I recommend it as a very useful tool to manage your tweets right where you are. Tweet Adder is another tool to manage your Twitter account as a whole. Tweet Adder is one of the best marketing source for your business. 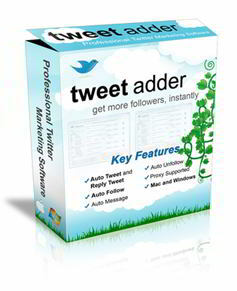 It is awarded the Best Twitter Marketing Software" Tweet Adder is worth of buying. It helps you to post automated tweets throughout the day. It also posts your tweets to Facebook and other pages that you synchronize in. It works automatically and posts your tweets randomly and also you can choose what task to automate. It also provides a complete statistics of your tweets and the number of clicks your tweets received. It shows a graphical representation of your referring sites to your tweets. It is a very useful tool and its worth buying for your profile. The use of these tools consume you some time that you can use it for some other purposes other than spending much time in Twitter tweeting all the time. Now its the time that I really love to hear the other Twitter Management tools that you are using now for your Twitter Stream. Its really informative the facts regarding different tools which are mentioned are really considerable and to the point and as well and it would be a good idea to look for these kind of more to view the situations in efficient manner.